We love a solid 5×7 speaker – they’re versatile, durable, and produce some of the best quality sound out there. Not to mention, there are tons of great choices no matter what you’re looking for. So many choices, we wrote this guide to help narrow down your speaker search. Are you looking for something powerful and loud? Or are you interested in something with precision sound control? No matter what you’re looking for, we’ve got just the speaker for you. Read on to see our top choices for 5×7 speakers! I Still Can’t Decide – Which One Would You Recommend For Me? When it comes to the best of the best in a 5 x 7 speaker, you don’t get better than this. The Polk Audio 225W Marine DB572 is the top of the line in audio quality and dependability, and there’s a reason it’s taken the top spot on our list. These speakers are incredibly high-quality and are at a great price point. Featuring both power and control with dynamic balance technology, you’re getting superb audio no matter what you use these speakers for. The 20mm tweeter ensures balanced mids and highs while an oversized cone allows for more air movement, meaning better bass. You also get unbeatable durability. The IP65 rating means these are safe from water, dust, humidity, and UV. You’re not going to find many marine-grade speakers at this price! Polk has been producing exceptional audio technology for years and they’re not stopping now. We were floored when we got to test these speakers out. For big time sound that won’t let you down, these are the speakers for you. 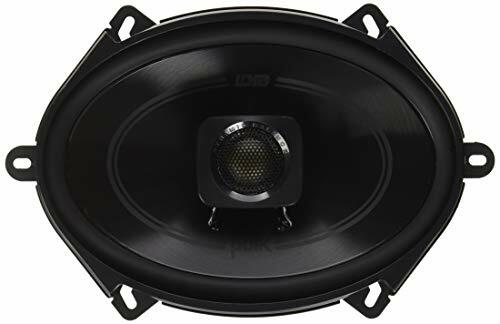 We love JBL at Dig My Ride, and for good reason – JBL is well-known for their top of the line audio products, and you’re getting an exceptional speaker with the GTO8629. Offering big sound and quality construction, the JBL is a fantastic choice for any audio enthusiast. It was a very tough choice for the top spot on our list of top speakers, and it’s easy to see why. The first two on our list offer exceptional sound quality, high-end materials for lasting durability, and maximum efficiency. At 180W per speaker, they’re less powerful than the Polk, making these better for someone looking for precision audio control and quality. 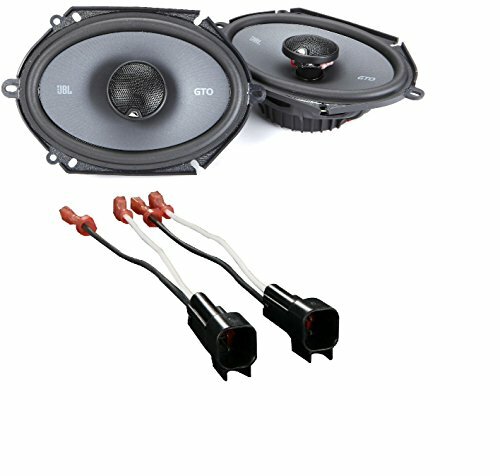 At 4 ohms, these speakers are going to maximize your unit output in your car to make the most out of your current system. JBL is known for quality over power, which is what you’ll get with this speaker. For a superb sound experience that everyone will enjoy, check out the JBL today. If you’re not concerned about budget and want something at the top tier of speaker systems, the Infinity is a great choice. The main reason it isn’t at the top of our list is the price – we like to recommend affordable options for everyone, and the Infinity is the most expensive option so far. However, we know these speakers are well worth the price. 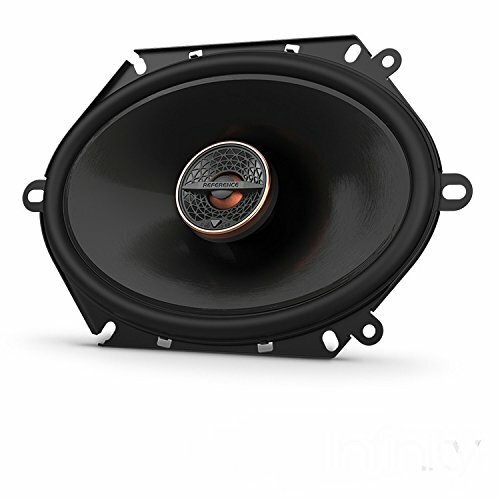 The Infinity speaker uses state of the art audio technology to create a premium audio experience no matter what vehicle you use them in – you’ll definitely notice an immediate difference after installing these! 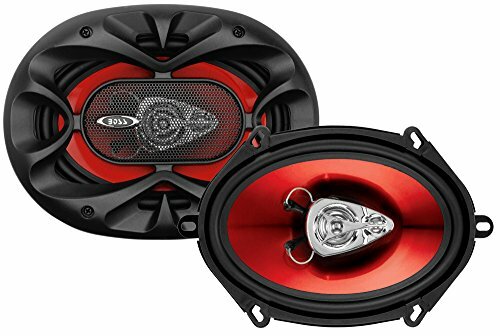 We love these speakers for their 360W and 3 ohms that make the absolute most out of your car’s system. Most speakers are 4 ohms or more. With 3 ohms, you’re getting less electrical resistance and maximum efficiencies. If you’re not concerned about budget and want to push the limits of audio technology, we recommend the Infinity! The Rockford Fosgate Punch P1572 takes us to the mid-level speakers, but you’re still going to get a great audio experience with any speaker on the list. At 120W of power and 89dB sensitivity, these speakers really pack a punch! We really love the Flex Fit basket on this speaker – this unique feature allows you to adjust the speaker after installation, so if you’re slightly off in the installation, you can easily make an adjustment without starting over. That means it’s a really beginner-friendly speaker that you can probably install yourself. Even though it’s a little higher in the price range for a mid-level speaker, you can save money in the long run by installing it yourself! Whenever you see silk dome in a speaker description, you know you’re getting smooth, controlled audio. That’s exactly what you get with these speakers. 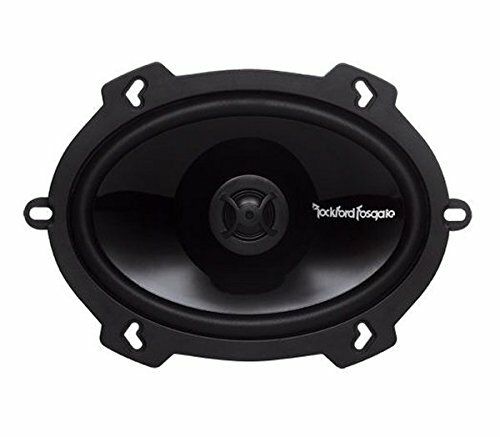 The CT Sound Tropo speakers are priced extremely competitively and are a solid choice for a replacement upgrade for your vehicle. For a mid-level speaker at an entry-level price, you won’t find many better than this one. This is a good speaker that will provide everything you’re looking for. Watch out for distortion at maximum volumes, but expect a surprising smoothness from the silk dome. These speakers boast an impressive frequency range of 50Hz – 20kHz and a .8-inch voice coil for improved fatigue-resistance. We couldn’t write this guide without mentioning some solid entry-level speakers that are a true value for the money. The first speaker in our entry-level section is the Pyle 5 x 7 Poly Injection 300W speakers. We love these speakers for the incredible price and awesome output at 300W. If you’re just getting into audio modifications for your car, this is a solid place to start. 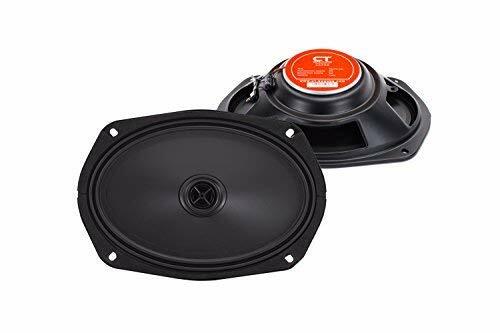 The price can’t be beat and you’re getting a well-rounded speaker that can really do a lot to improve the audio in your car. For someone interested in increasing volume, these are perfect. Just like other speakers, these do have the potential to distort, so be careful not to push these speakers too far to avoid blowing them out. We recommend these to anyone starting out and learning about speakers – for a very small investment you’re getting some pretty decent speakers that will surely be an upgrade from your stock system. Rounding out our list is the Boss Audio CH5730 – if you’re looking for something basic and incredibly affordable, check these out. With 150W per speaker, you’re going to get good audio range for the price. For a basic, entry-level speaker, this is a great choice. We really like the Boss for its unbeatable price point, making this the perfect option for a cheap and simple replacement. It has a pretty decent power max at 150W, meaning you can really get a lot out of these speakers. 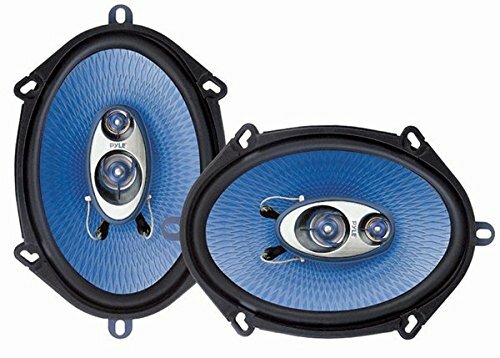 And with such a great price, you won’t have to worry about blowing these speakers out and losing out on a lot of money – they’re cheap, quality, and are very easy to replace! It really depends on what you’re looking to get out of a new speaker. Each offers their own strengths and fit different types of speaker users. The Polk is a really well-rounded, high-quality speaker, which is why we put it at the top of our list. With 225W and marine grade durability, you can’t go wrong. If you’re someone that’s looking for both power and audio control, this is a good option because you get a little bit of both. The JBL is for someone that can forego audio power and is really looking for top of the line audio quality. JBL is famous for their exceptional audio products, so if you’re looking for pure, clean audio every time, this is the one for you. Finally, the Infinity is sheer power. At 360W, it’s one of the most powerful speakers on the market. While it’s a little pricier than most, it’s worth the price – speakers with similar max wattage have issues with distortion, which isn’t the case for the Infinity. As you can see, it really is a tough choice, and we wish we could give the top spot to all three speakers! Since we had to choose one, we went with one that was reasonable priced and could be used for both audio control and power – when it comes down to it, the Polk is truly something special. We could spend an entirely separate guide writing about frequency response and how it impacts speakers, but we will provide an abbreviated version. Simply put, frequency response is the range of sound frequencies that the speakers can project. A smaller range of frequency response means a more limited range of sound the speakers can produce. Here is a more extensive look into frequency response and what it means for speakers.